Open source content management systems offer a variety of benefits that proprietary CMS fail to deliver. Lower costs, more flexibility and control over your website, community support and other advantages make WordPress a better platform for hosting a website than a proprietary CMS. Because the content and design is not proprietary, initial fees when building a website on WordPress are minimal. Downloading and upgrading the software is free, and although some plugins and add-ons cost extra, these fees are generally relatively small. With proprietary CMS websites, there are typically only a few extensions that come standard and adding additional extensions can often involve high licensing and customization costs. Although there may be development costs associated with adding non-standard WordPress capabilities that aren’t available through plugins, these costs are probably much less than what you would pay for a proprietary CMS to develop the same capabilities, and offer the additional benefit of freedom to choose any developer to customize these add-ons to your site. With WordPress, you can contract any open source developer, affording you more freedom of choice as you build your website. WordPress has a huge community with millions of users and most developers are familiar with it. If a propriety CMS company’s team doesn’t meet your quality standards or if the company goes out of business, you’ll be left with a website that is essentially unusable and you’ll most likely have to start all over from scratch. If you’re not happy with an initial designer who has worked on your WordPress website, you can easily hire another developer who is familiar to WordPress. 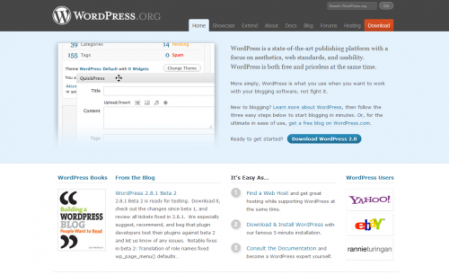 One of WordPress’ advantages over other open source CMSs is that it is especially user friendly. You don’t have to be knowledgeable about HTML coding to be able to successfully manage a WordPress website, so it’s easy for any user to make minor changes to a WordPress site. With a proprietary CMS website, you’ll more likely have to pay higher prices for any changes. WordPress offers the stability that comes from millions of users reporting bugs and other issues that may arise with a content management system. While proprietary CMS companies can offer direct support, they may not be able to be as fast or responsive in updating software and working out problems. Since WordPress is such a popular platform, it should be easy to find another user or developer who has experience in WordPress to help you work through any issues you’re having with your website. WordPress is designed to be search engine friendly, meaning extra SEO efforts can be minimal. Also, open source CMS websites are generally easier to integrate with third party sources like YouTube, Flickr, Facebook, Twitter, etc. If you ever want to consider selling your website, building it in WordPress makes it more appealing to buyers, who will likely want an open source CMS that they are already familiar with.